A common piece of received wisdom about cannabis is that it causes paranoia. This paranoia is part of a wider suite of psychiatric problems that cannabis is erroneously blamed for – problems that justify putting people in cages to protect them from themselves. As this article will examine, the argument that cannabis should be prohibited because it causes paranoia is invalid. The truth is that it’s prohibition that causes paranoia. Cannabis itself is medicinal, and has never caused paranoia in and of itself. Proof for this is unnecessary for anyone who has used cannabis in the Netherlands or, more recently, in places like Colorado, Uruguay, Washington or California. Anyone who has done this can tell you that the same kind of paranoia that people sometimes get when using cannabis in New Zealand does not occur. There are clear reasons why using cannabis creates paranoia in places like New Zealand. The first group of reasons relate to the Police. The fact is that the Police do not make moral judgments about the laws they are enforcing. 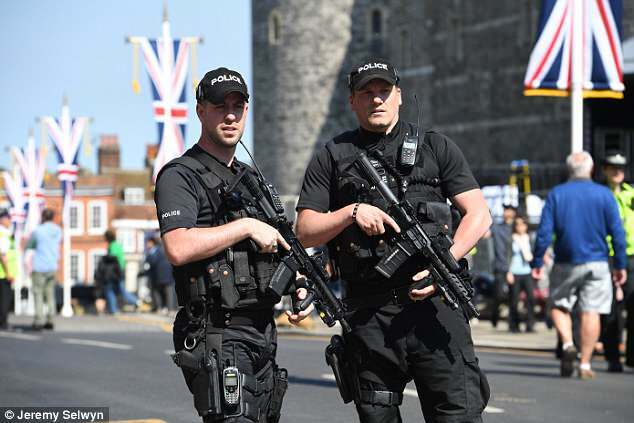 To the sort of person who becomes a Police officer, there’s no difference between arresting a murderer, arresting a cannabis user or arresting someone for being a member of a race that the Government has targeted for extermination. The Police just enforce the law. Therefore, anyone using cannabis in a place where it is illegal has every reason to be paranoid, because there’s a chance that if their activity was discovered by the Police they could end up locked in a cage. It’s possible to get seven years’ imprisonment for growing a medicinal cannabis plant in New Zealand, and even though a custodial sentence is unlikely for simple possession the fear is reasonable. All of the reasons within this group have been created directly by cannabis prohibition itself. If cannabis was legal, there would be no reason to fear the Police or the “Justice” system whenever one used it or had it in one’s possession. The second group of reasons relate to society. When a person uses cannabis and realises that it is nothing like what it is said to be like, it’s natural to ask some very deep and dark questions about the nature of society. In particular, one comes to ask how it is that cannabis could have become illegal in the first place, given that it’s clearly a medicine that has beneficial effects. Eventually this leads to people asking some extremely difficult questions. If it was only possible to make cannabis illegal by virtue of telling an enormous amount of lies about it, what nefarious forces controlled the resources necessary to propagate all these lies? Who is really in control of this system, if they can make lies into a truth that is parrotted by Police, politicians, teachers and doctors? And if doctors didn’t even know that cannabis is medicinal despite the stacks and stacks of evidence in favour of the idea, what else don’t they know? Or, even worse, if they did know that cannabis was medicinal but lied about it for sake of greater profit or for fear of Government disapproval, what else could they be lying about? Naturally, all this sort of thinking is capable of creating intense anxiety – but it’s cannabis prohibition that makes this possible. Without cannabis prohibition, none of this reasoning makes any sense, and is unlikely to be entertained. A pleasant cannabis experience will not cause a person to question the structure of society, unless that society has not already told him that cannabis was the boogeyman. In any case, many drugs can be anxiogenic if a person does not use them correctly. Caffeine can easily cause paranoia and anxiety if a person who isn’t used to it takes too much, and this is considered humourous by most people, not a reason to ban coffee. If cannabis causes a person anxiety, they should either use a different strain (preferably one with more CBD) or abstain from using it altogether. Weed is not necessarily for everyone! It is possible that cannabis can cause a kind of existential paranoia. Many people are conditioned to never think about deeper philosophical questions, and some of these people discover that the cannabis high induces them to do so. 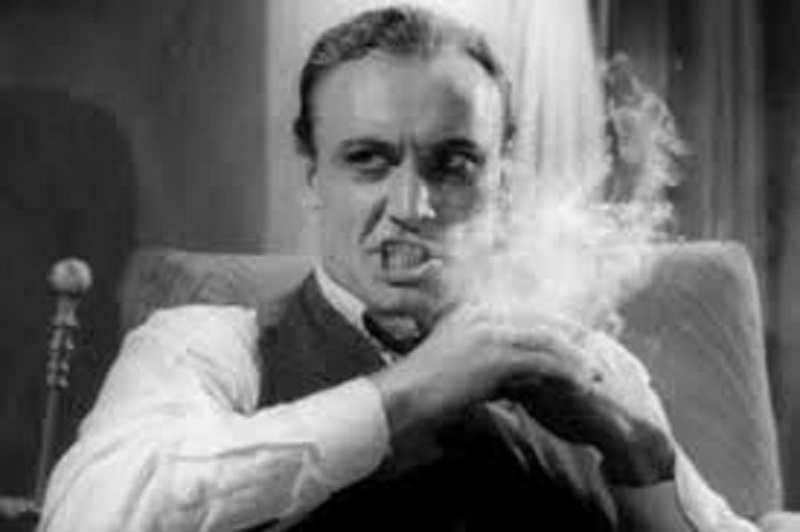 Cannabis can have a massively deconditioning effect, why is why artists use it, but this can lead to the user entertaining lines of thought that have otherwise long been suppressed. The way to deal with this, however, is either to fix it by philosophy or to avoid using cannabis (or to try a form of cannabis with less THC in it). Life is anxiogenic in a myriad of ways, and therefore it’s unreasonable to expect that the deeply contemplative mindset brought about by cannabis use should leave a person immune to paranoia. It is a similar case with most other cannabis-related anxiety. The argument that cannabis ought to be illegal because it causes paranoia is false. The majority of paranoia brought on by cannabis use is a function of prohibition. If cannabis prohibition went away, most of the paranoia associated with it would also go away, therefore we’re better off if it were legal. Of all the terrible arguments made in favour of cannabis prohibition – and there are many – one of the worst is the argument that contends that cannabis prohibition is a good thing because some of the people that get involved in the criminal justice system are incentivised to stop using cannabis. This article will examine the flaws in this logic. One of the saddest peasant attitudes remaining in our society is the idea that certain people just need a “good kick up the arse” to encourage them to function properly again. The idea seems to be that a “short, sharp shock” of physical abuse can be beneficial to drive dullness from a person’s mind. It’s an abusive attitude that is a remnant of a less enlightened time and, fortunately for the rest of us, it’s dying off. This attitude finds expression in the idea that getting arrested on account of a cannabis offence could be a good thing, if that led to a person suddenly appreciating the consequences of cannabis use and changing their habits for the better. There is an element of logic to this line of reasoning. After all, it’s common for young petty criminals to become afraid the first time they encounter some genuine heat from the Police, or the first time they do a custodial sentence and realise that prison isn’t a great deal of fun after all. This fear can, indeed, change behaviour. But what this approach leaves out is two things. The first is that many people simply don’t want to stop smoking cannabis, any more than they want to stop playing rugby or buying magazines with Harry and Meghan on the cover. You could instruct the Police to arrest people for playing rugby in the park, on the grounds that their behaviour was recklessly dangerous, but it wouldn’t make it the right thing to do or a good idea. Neither would it stop people from doing it. Psychologically speaking, it’s hard to declare that you know how another adult should live their lives, and so much better than them, that you can fairly justify setting the Police on them if they don’t do what you say they should do. In another time and place, that degree of coercion would be recognised as slavery, and it’s no wonder that people naturally disobey the cannabis laws today. So this means that deploying the Police to force people into getting medical treatment for using cannabis (as if that even made sense) will not be effective in the long term. People feel like they have the right to use cannabis, and they will continue to feel as if they have the right, because it’s natural to think it ridiculous that a medicinal plant could be illegal. It’s possible that Police involvement in a person’s life might reduce their level of cannabis use, but so what? Punching someone in the face for eating a Big Mac might also inspire them to make healthier lifestyle decisions, but that doesn’t mean that the overall benefit of the action outweighs the overall harm. The second is that there are cases of legitimate medicinal need, and encounters with the criminal justice system are not helpful in cases of medicinal need. Police officers are not qualified doctors and neither can they be. Having them as the first line of dealing with cannabis users makes as much sense as making the Army responsible for it. The argument refuted in this article is usually made by people who are entirely unaware of the medicinal properties of cannabis. When they become aware of the medicinal properties of cannabis they tend to stop making it. Of course, if a substance really is medicinal then it ought to be something supplied by doctors and pharmacies; the Police should not be needed at any stage. There may, indeed, be cases where there is a cannabis user who needs psychiatric intervention. After all, there are many instances in which certain strains of cannabis will not be helpful. A person who is acutely psychotic from sleep deprivation doesn’t need a honking high-THC strain that will wire them even tighter. But even in cases like this, it’s not Police intervention that would be helpful, unless it comes as part of the Mental Health Act or similar and not as part of enforcing the law against the “crime” of cannabis. A person who has mentally disintegrated so far that they need psychiatric intervention is already in a kind of hell. The last thing they need is to encounter law enforcement. The argument that cannabis users can be persuaded to get treatment for “cannabis abuse” by getting arrested, and then threatened with further attacks from the Justice system, is neither fair for rational. It would be better for cannabis to be made legal and destigmatised, so that people who did need treatment would be more likely to get it. Police involvement is unnecessary. 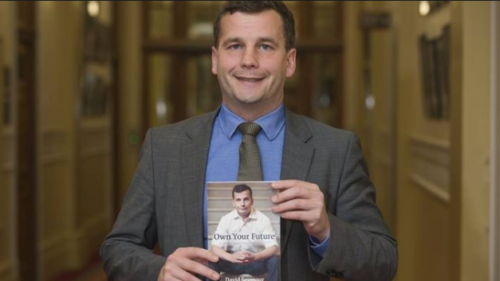 The eighth chapter in Own Your Future is ‘Transport’. Again Seymour opens with another Auckland-based anecdote. One wonders if he’s ever been outside of Auckland except for flights to Wellington. His story is about sitting stuck in traffic, not moving, and realising that Auckland had a traffic problem (the focus on stories like this makes it easy to understand why ACT gets so few votes from outside of Auckland). Auckland’s traffic woes and the effect that congestion has on economic efficiency is discussed at length. Seymour quips that “Auckland gridlock is the same phenomenon as Russians queuing for bread in the Soviet Union.” Again the obsessional Auckland focus seems strange – why devote so much space to a subject that has no relevance to 60% of the New Zealand population? The Auckland Council needs another $12 billion, Seymour tells us. Light rail is mentioned in the context of Auckland’s pipe dream to be a world-class city, but his first proposal is for the Government to get out of the way of ride-sharing. Keeping with the ACT them of reducing regulation wherever possible, he suggests that Uber drivers shouldn’t have to get licenced as if they were taxis before they begin operating. Seymour’s best point here is not so much about Auckland transport but about the fact that Baby Boomer Members of Parliament are not qualified or even suited to understand new technology, such as Uber. Most of them get ferried around by a Parliamentary limousine service, and ride-sharing technology is simply something from another world. ACT’s proposal to streamline the approval of ride-sharing applications seems like a good one here. Hilariously, Seymour complains about a “prejudice against market forces” in New Zealand, as if we weren’t already such die-hard fans of neoliberalism that we raise the refugee quota in the midst of our worst ever housing crisis, one that has working families living in cars. This is written in the context of the Government getting out of the way of people trying to use ride-sharing services. Another solution to congestion is electronic tolls in areas that are known to be congested. Seymour doesn’t debate the obvious criticism that such tolls are effectively another tax on road users, preferring to use the example of Singapore. It seems very odd that the supposed proponent of small government wants a system where every road user is tracked by GPS and charged a fee for going into a government-designated congestion zone. True to his neoliberal roots, Seymour completely omits any mention of how the recent flood of immigrants might have led to increased congestion in Auckland. The New Zealand population increased from 4.2 million to 4.8 million during the term of the Fifth National Government, and most of those moved to Auckland, but Seymour will not mention this because mass immigration serves not only the major money interests to which he is beholden but also pumped up the house prices of his Epsom electorate. 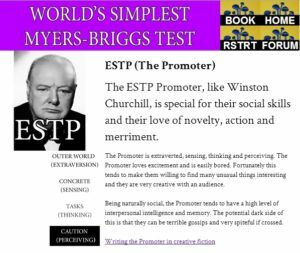 This is easily the world’s simplest Myers-Briggs personality test. At the heart of all good creative fiction is a moral dilemma that tears your characters in two. This book describes 16 basic human desires and how they can be used in creative fiction to skewer your characters in dilemmas that will engage your readers. From power to status, from vengeance to curiosity, this book offers a plethora of ideas for writers who want to amaze their readers with the kind of dilemma that reveals the innermost desires of your character’s hearts. In sixteen chapters, each reflecting a basic human desire, this book will give any author ideas about how to write a story that leaves the reader enthralled by the difficult decisions your characters have to make in the course of their story lives. 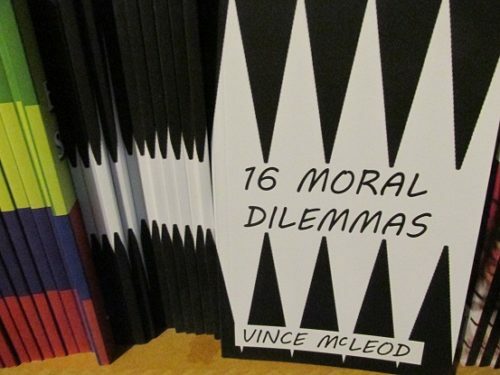 New Zealand readers can buy a paperback copy of 16 Moral Dilemmas from TradeMe HERE. International readers can buy a paperback copy of 16 Moral Dilemmas from Amazon HERE. New Zealand and International readers can buy a Kindle copy of 16 Moral Dilemmas from Amazon HERE.